Look out for flying darts! Our newest pan tilt turret accessory is now available: the Foam Dart Gun Kit. If you want to add a little fun and firepower to your robot turret (or any other project) you’ll love this foam dart gun kit. 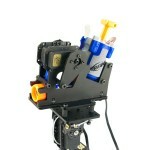 The included single shot dart gun packs quite a punch, with a typical range of about 30 feet! After a little projectile motion calculation, we estimate the average dart speed to be 40-50 feet/second. This entry was posted on Monday, June 23rd, 2014 at 1:07 pm	and is filed under Front Page News, Misc, New Kits / Products. You can follow any responses to this entry through the RSS 2.0 feed. You can leave a response, or trackback from your own site.